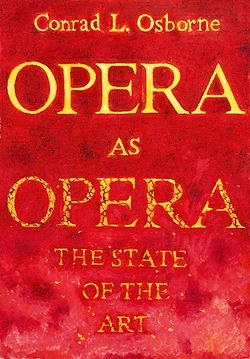 "It is, without question, the most important book ever written in English about opera in performance. It is also a cri de coeur, documenting the devastation of a single precinct of Western high culture in modern and postmodern times...The subject matter ranges from philosophy and aesthetics to theater and theater history, to the mechanics of the human voice...The pace of exegesis is at all times unhurried; Mr. Osborne is intent on telling us everything...Conrad Osborne flings the gauntlet, relentlessly inquiring: What happened? What to do? It is hardly an exaggeration to suggest that the fate of 21st-century opera partly hinges on the fate of the bristling insights delineated and pondered in this singular mega-book." This review and the companion interview with Conrad L. Osborne, appearing here in the original English, were written on assignment from Oper! Das Magazin (Berlin), Ulrich Ruhnke, Editor-in-Chief. The texts will be appearing there shortly, in German translation. Conrad L. Osborne: "Opera as Opera. The State of the Art"
"Opera as Opera" . . . is a book for confirmed opera lovers, and recommended as required reading for all who wish to strive for the opera singer's life, or who have to do with this art form in their life's work. "Opera as Opera...essential for every opera-lover who cares 'what comes next.' That it is also frequently entertaining, even hilarious, doesn't hurt a bit. Can't remember ever learning more from a book about my own field."